If you’re looking for the perfect wedding ring, then Riddle’s Jewelry is the perfect place to look. 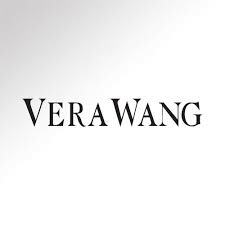 The company has been in business for more than 60 years, and has a full range of jewelry including wedding rings and sets, watches, bracelets, and more. As a one stop shop for the bride or potential groom looking for wedding jewellery, they are hard to beat. While prices and styles vary, most buyers are sure to find something they love in the shop. 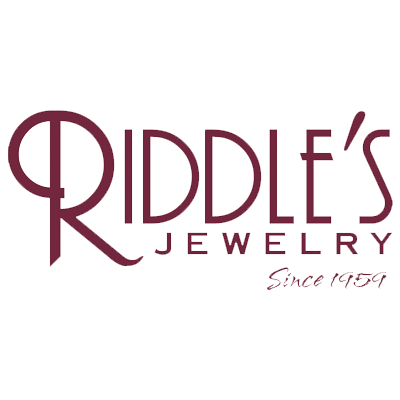 Here are ten fabulous engagement rings you can find at Riddle S Jewelry in 2013. For the lady who likes a little color in her life, consider the Ladies Treated Blue and White Diamond Engagement Ring as the perfect option. This ring features a white gold band set with 1.5 Karats of blue and white diamonds. 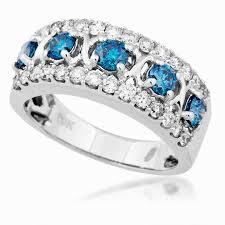 While not as pricey as a full white diamond ring, the brilliant colors of the blue diamond are sure to win her heart. 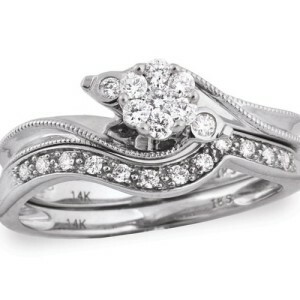 This ring retails for $2,712 to $1,800 when available. Another non-classic, this Ladies Diamond Engagement Ring in Yellow Gold is recommended for the bride to be who either looks better with gold, or who isn’t extremely traditional. Keep in mind that while silver and white gold bands are traditional for engagement rings, many ladies simply prefer the look of gold. This ring features a square cut center diamond with inset smaller diamonds on either side, and glistening yellow gold for a total of 1.4 karats of gems. It’s retail price of $3,000 to $4,285 tells her that you’re not planning on skimping on the wedding, but make sure she likes gold before you buy it. The Square Cut Ladies Diamond Engagement Ring in White Gold offers classic glamor with a bit of modern sparkle, and is perfect for brides to be of all ages. The large square cut diamond sets off the entire look and feel of the ring, while smaller diamonds set to either side make it appear all the more glamorous. Plus, with 14 individual diamonds set into this $5,000-$3,000 masterpiece, she’s sure to be too dazzled by the diamonds to even think about saying no. If you’re looking for an affordable but elegant engagement ring, then the Elegant Vows Cluster Engagement Ring is the perfect choice for you. 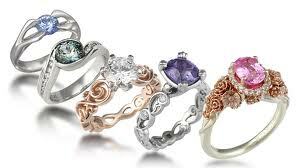 The engagement ring is listed between $855 and $599 which is quite affordable compared to most Riddle S Jewelry. The ring itself features a band of slender diamonds with a single cluster of tiny diamonds accenting the center. 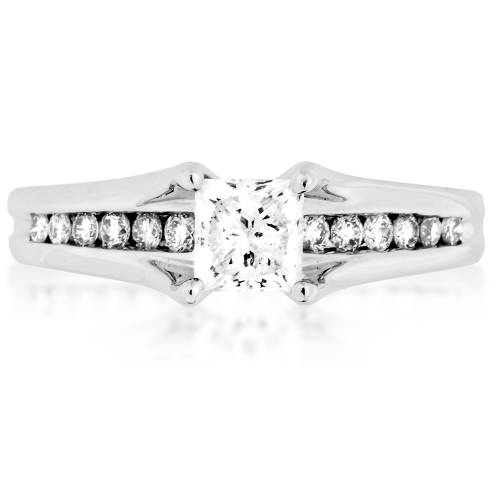 Plus, any Elegant Vows engagement ring fits snugly over an Elegant vows wedding ring so that the bride can continue to wear both after the wedding. Another square cut style that’s sure to win her heart, the Ladies White Gold Quad Engagement Ring is everything the glamorous bride dreams of in an engagement ring. A large square cut center stone draws the eye, while twists of diamond side stones keep attention, and wrap around the larger gem to accent it. The ring itself retails for $1,700 to $1,190 but with a clever design it makes it’s .75 carats of gems look like much, much more. 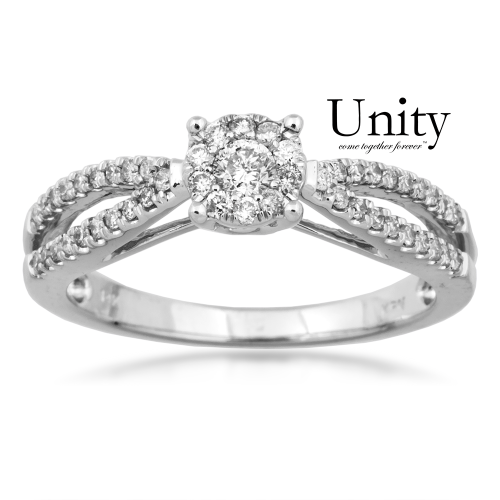 A slim band set with an astonishing 78 diamonds, the Ladies Diamond Unity Engagement Ring is a sure winner. The band itself features two loops of white gold, each set with diamonds, leading up to a center cut diamond with more diamond accents. The rings simple design, but luxuriant appearance is sure to win over even the hardest to please woman, and it’s more affordable than most would think at $900 to $1,285. Women who love opulence will fall instantly in love with this Ladies Unity Diamond Engagement Ring in White Gold, although the groom to be most likely won’t have to worry about her leaving him for the ring. 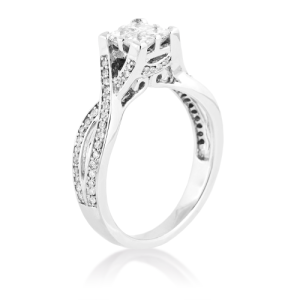 The rings main feature is a wide center bezel set with a large centerpiece diamond that is closely set with smaller diamonds to enhance and increase its size. 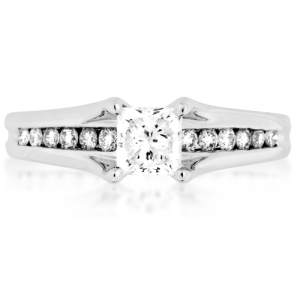 The band is white gold with inset rows of diamonds on either side, and tooled edges. 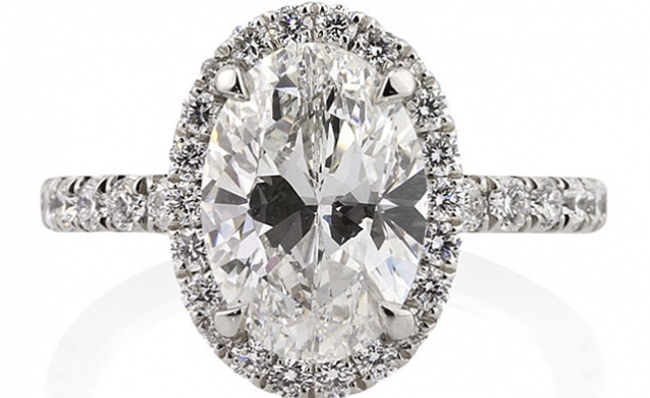 Except for the $3,712- $2,598 price tag, there’s nothing not to love about this ring. 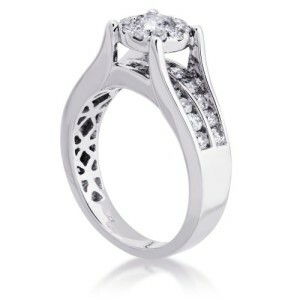 Another ring from Unity, this white gold engagement ring is also a thriller, but in different ways. The Ladies Unity Diamond Engagement Ring in White Gold is a modern classic that is sure to please the discerning bride with it’s large center stone, and inset double row of smaller diamonds. The unique look and feel of this diamond ring is sure to win hearts, especially for women who like their possessions to be a little different from the norm. The ring retails for $3,855 – $2,699 and is worth every penny to the woman who knows what she wants. 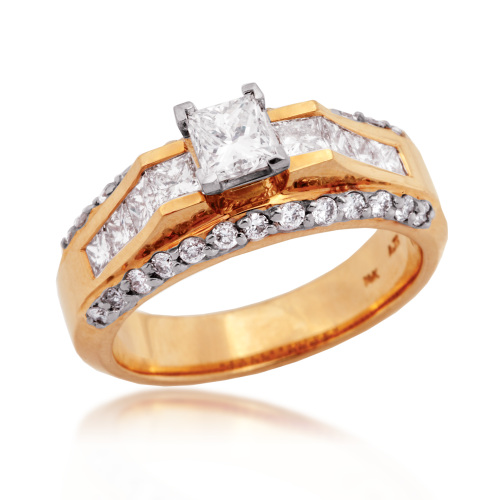 A simple band does nothing to take away from the splendor of the single karat diamond set into this ring. While not every bride will find this ring appealing, many will. Consider this ring as a great way to show your bride to be that it’s the big things that matter, and not the little ones. 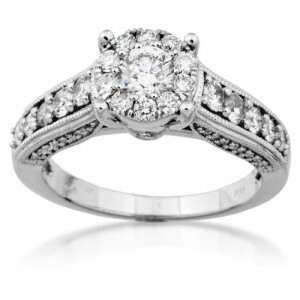 Plus, the single large stone is a very classic look for the bride who loves vintage. 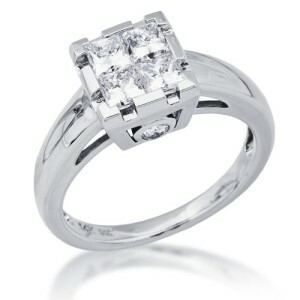 The Ladies Quad Diamond Engagement Ring in White Gold retails for $3712 to $2,598. 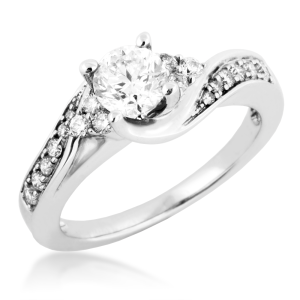 The Ladies Diamond Engagement Ring in White Gold is a pure classic, and almost impossible to go wrong with. This ring has just enough diamonds to look glamorous and sultry, while spreading them out just enough to make it modern, classy, and elegant. The center cut 14 karat diamond is set with two lines of complementar 1-2 quality diamonds on either side. The ring costs $3,000 to $4,285.